Welcome to S.D. Feather Furniture Designs. We are an innovative furniture company that prides itself on creating works of functional art. Furniture should be more than just something you lay a magazine on. It should be the focal point of a room and a conversation piece. The furniture you choose should be as unique as you are, so check out our designs. Enjoy! 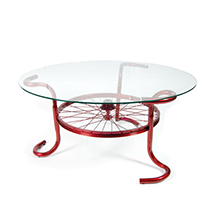 We now offer a line of tables for the cyclist. Each design is created from actual bike parts.